Daily Illuminator: Mean Streets And Dangerous Seas! 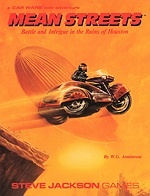 August 27, 2013: Mean Streets And Dangerous Seas! Recent weeks have seen two classic Car Wars re-releases, new to e23! First, we note that over 70% of the world's surface is covered in water. That means, thanks to Boat Wars, the Car Wars universe is now 70% more dangerous! 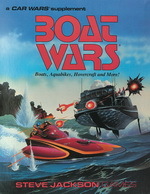 * This set features the rules to make boats of all sizes, plus hovercrafts, aquabikes, and more. It's also got gear for the high seas, sample vehicles, and, of course, combat for aquatic autoduellists. (Aquaduellists?) There are ready-to-print blue-hued maps, and counters that cover all manner of seafaring savagery. (And we haven't even mentioned the explosive ducks . . .) The seas are ready for mayhem; water you waiting for? Or perhaps you'd prefer to face the risky roads alone. That challenge awaits you with Mean Streets. This programmed adventure begins with your death . . . awakening as a clone, looking to finish what your previous form started. This adventure is great for solo play, and it's also a fine "vehicle" for two-player fun. The inclusion of stats for 18 vehicles means you'll be using this one even after you thwart the nuclear plot at the center of this tale. Watch the median; these Mean Streets are anything but average! * SJ notes: Do the math. It's actually more than three times as dangerous.